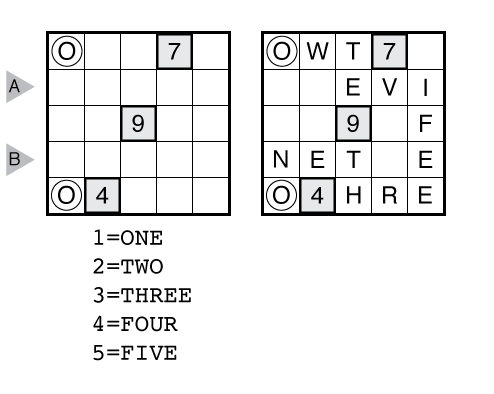 Author/Opus: This is the 3rd puzzle from guest contributor Nikolai Beluhov. 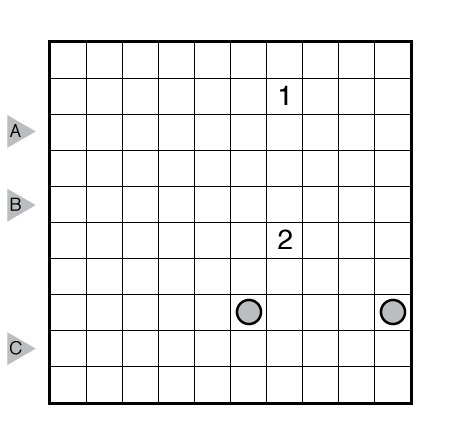 Answer String: Enter the number of cells in each of the snake segments from left to right for the marked rows, starting at the top. Separate each row’s entry with a comma. 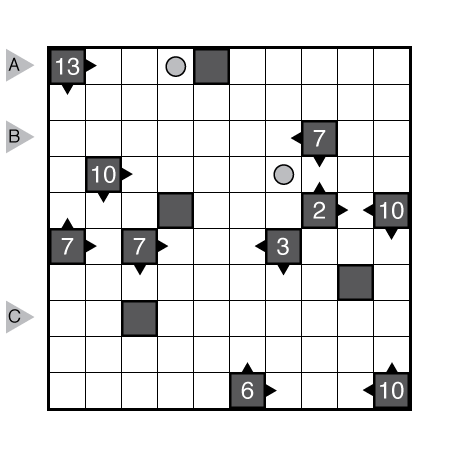 Author/Opus: This is the 95th puzzle from our contributing puzzlemaster Serkan Yürekli. 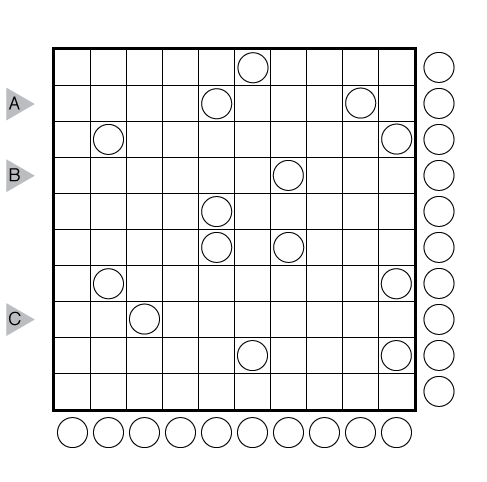 Rules: Fill in every circle inside and outside the grid with a prime number. (All prime numbers inside and outside the grid are marked.) Then locate a numbered snake (a 1-cell wide path) that starts with 1 and goes to 45 (1 to 11 in example). The snake cannot touch itself, not even diagonally. Digits outside the grid indicate how many cells in that row or column are occupied by the snake. Answer String: Enter the length in cells of each of the snake segments from left to right for the marked rows, starting at the top. Separate each row’s entry with a comma. The answer to the example is “3,11”. Answer String: Enter the length in cells of each of the snake segments from left to right for the marked rows, starting at the top. Separate each row’s entry with a comma. The answer to the example is “13,2”. Author/Opus: This is the 94th puzzle from our contributing puzzlemaster Serkan Yürekli. 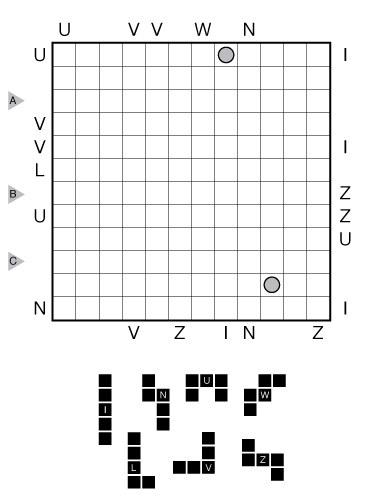 Rules: Add letters to some empty cells to make a snake that doesn’t touch itself, not even diagonally. The snake’s head and tail are indicated by circles. The snake is made out of spelled out numbers, and some letters are given that must be part of the snake. Each numbered cell indicates the total sum of the distinct words that touch that cell, including diagonally. Not all words need to be used, but no word is used more than once. Answer String: Enter the length in cells of each of the snake segments from left to right for the marked rows, starting at the top. Separate each row’s entry with a comma. The answer to the example is “3,31”. 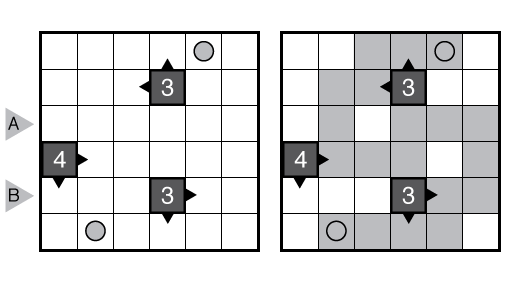 Author/Opus: This is the 93rd puzzle from our contributing puzzlemaster Serkan Yürekli. 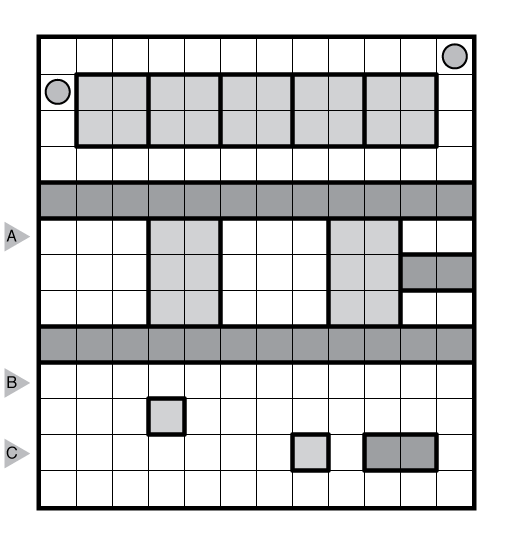 Rules: Draw a snake (a 1 cell-wide path) in the grid whose head and tail are given by circled cells. The snake can touch itself diagonally, but cannot touch itself orthogonally or revisit any square. Besides the snake, the remaining cells must form exactly nine white areas, one of each size from 1 to 9. 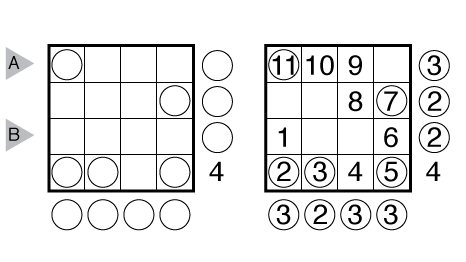 Numbers in the grid must be part of white areas of the indicated size. Answer String: Enter the length in cells of each of the snake segments from left to right for the marked rows, starting at the top. Separate each row’s entry with a comma. Author/Opus: This is the 92nd puzzle from our contributing puzzlemaster Serkan Yürekli. Rules: Draw a snake (a 1-cell wide path) from one dot to the other by moving horizontally or vertically between adjacent squares. The snake cannot touch itself, not even diagonally. All highlighted regions must be visited by the snake, and may be re-entered. If two or more highlighted regions have the same shape and orientation, then how the path passes through those shapes must be identical. Answer String: Enter the number of cells used by each snake segment from left to right for the marked rows, starting at the top. Use both digits for any two-digit number. Separate each row’s entry with a comma. 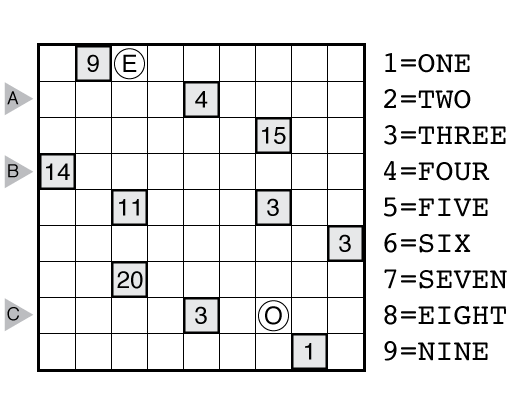 Author/Opus: This is the 91st puzzle from our contributing puzzlemaster Serkan Yürekli. 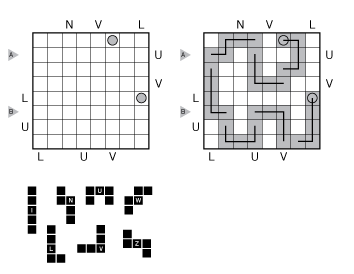 Rules: Draw a snake (a 1-cell wide path) out of pentominoes that doesn’t touch itself, not even diagonally. The head and tail of the snake are given by circles. Pentominoes can be rotated/reflected, and can be used more than once. 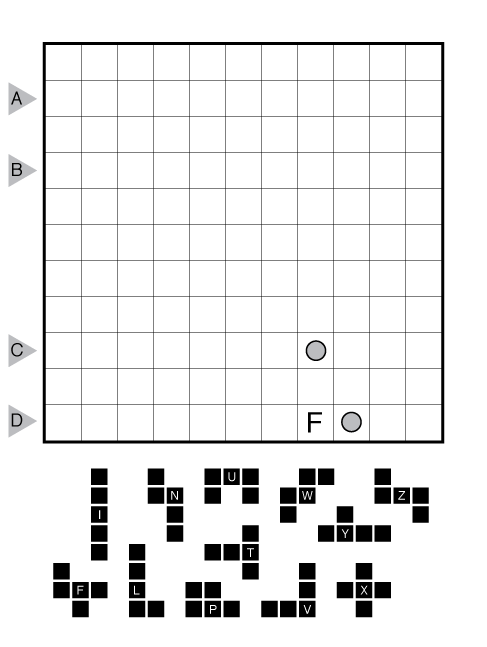 The letters outside the grid represent the first pentomino visible in the corresponding direction. Answer String: Enter the number of cells used by each of the snake segments from left to right for the marked rows, starting at the top. Separate each row’s entry with a comma. The example has the answer “211,231”.